The lead actor, Brandon Lee, was accidentally wounded on set during filming by a defective blank and later died in the hospital during surgery. With only eight days left of production, unfinished scenes that were to feature him were dealt with using a rewritten format in the script, a stunt double, and digital special effects. The film is dedicated to both Lee and his fiancée, Eliza. Despite the several production setbacks due to Lee's death, The Crow was well-received critically for its unique visual style, premise, emotional depth and its tribute to the deceased actor. The film opened at the top of the box office and attained a strong cult following. It is the first installment of a franchise, which includes three sequels and a television series. On October 30, Devil's Night in Detroit, Sergeant Albrecht is at the scene of a crime where Shelly Webster has been beaten and raped, and her fiancé Eric Draven then died on the street outside, having been stabbed, shot, and thrown out of the window. The couple were to be married the following day, on Halloween. As he leaves for the hospital with Shelly, Albrecht meets a young girl, Sarah, who says that she is their friend, and that they take care of her. Albrecht tells her that Shelly is dying. One year later, a crow taps on the grave stone of Eric Draven; Eric awakens and climbs out of his grave. Meanwhile, a low level street gang, headed by T-Bird, is setting fires in the city. Eric goes to his old apartment and finds it derelict. He has flashbacks to the murders, remembering that those responsible were T-Bird and his gang: Tin Tin, Funboy and Skank. Eric soon discovers that any wounds he receives heal immediately. Guided by the crow, he sets out to avenge his and Shelly's murders by killing the perpetrators. The crow helps Eric locate Tin Tin; Eric kills him and takes his coat. He goes to the pawn shop where Tin Tin pawned Shelly's engagement ring. Eric forces the owner, Gideon, to return the ring and blows up the shop, letting Gideon live so that he can warn the others. Eric finds Funboy with Sarah's mother, Darla. After killing Funboy, Eric talks to Darla, making her realize that Sarah needs her to be a good mother. He visits Albrecht, explaining who he is and why he is here. Albrecht tells him what he knows about Shelly's death and that he watched as she suffered for thirty hours before dying. Eric touches Albrecht and receives from him the pain felt by Shelly during those hours. Sarah and her mother begin to repair their strained relationship. Sarah goes to Eric's apartment and talks to him. She tells him that she misses him and Shelly. Eric explains that, even though they cannot be friends anymore, he still cares about her. As T-Bird and Skank stop at a convenience store to pick up supplies, Eric arrives and kidnaps T-Bird. Skank follows the pair and witnesses Eric kill T-Bird; he escapes and goes to Top Dollar, a top-level criminal who controls all the street gangs in the city. Top Dollar and his lover/half-sister Myca have become aware of Eric's actions through various reports from witnesses. Top Dollar holds a meeting with his associates where they discuss new plans for their Devil's Night criminal activities. Eric arrives looking for Skank. A gun fight ensures the deaths of nearly all present, and Eric kills Skank. Top Dollar, Myca and Grange, Top Dollar's right-hand man, escape. Eric, having finished his quest, returns to his grave. Sarah says goodbye to him, and he gives her Shelly's engagement ring. She is abducted by Grange, who takes her into the church where Top Dollar and Myca are waiting. Through the crow, Eric realizes what has happened and goes to rescue her. Grange shoots the crow as it flies into the church, making Eric lose his invincibility. Myca grabs the wounded crow, intending to take its mystical power. Albrecht arrives, wanting to pay his respects to Eric, just after Eric is shot and wounded. Top Dollar grabs Sarah and climbs the bell tower as a fight ensues, and Grange is killed. The crow escapes Myca's grip, claws her eyes, and sends her down the bell tower to her death. When Albrecht is wounded, Eric climbs to the roof of the church on his own. There, Top Dollar admits ultimate responsibility for what happened to Eric and Shelly. In their fight, Eric gives Top Dollar the thirty hours of pain he absorbed from Albrecht; the sensation sends Top Dollar over the roof of the church to his death. Sarah and Albrecht go to the hospital, and Eric is reunited with Shelley at their graves. Brandon Lee died of a gunshot wound on March 31, 1993, after an accidental shooting on set at EUE Screen Gems Studios in Wilmington, North Carolina. In the scene in which Lee was accidentally shot, Lee's character walks into his apartment and discovers his fiancée being beaten and raped by thugs. Actor Michael Massee's character fires a .44 Magnum Smith & Wesson Model 629 revolver at Lee as he walks into the room. A previous scene using the same gun had called for inert dummy cartridges fitted with bullets, but no powder or primer, to be loaded in the revolver. For close-up scenes which utilize a revolver, where the bullets are clearly visible from the front, and do not require the gun to actually be fired, dummy cartridges provide a more realistic appearance than blank rounds, which have no bullet. Instead of purchasing commercial dummy cartridges, the film's prop crew, hampered by time constraints, created their own by pulling the bullets from live rounds, dumping the powder charge then reinserting the bullets. However, they unknowingly left the live percussion primer in place at the rear of the cartridge. At some point during filming, the revolver was apparently discharged with one of these improperly-deactivated cartridges in the chamber, setting off the primer with enough force to drive the bullet partway into the barrel, where it became stuck (a condition known as a squib load). The prop crew either failed to notice or failed to recognize the significance of this issue. In the fatal scene, which called for the revolver to be actually fired at Lee from a distance of 12–15 feet, the dummy cartridges were exchanged for blank rounds, which feature a live powder charge and primer, but no bullet, thus allowing the gun to be fired without the risk of an actual projectile. As the production company had sent the firearms specialist home early, responsibility for the guns was given to a prop assistant who was not aware of the rule for checking all firearms before and after any handling. Therefore, the barrel was not checked for obstructions when it came time to load it with the blank rounds. Since the bullet from the dummy round was already trapped in the barrel, this caused the .44 Magnum bullet to be fired out of the barrel with virtually the same force as if the gun had been loaded with a live round, and it struck Lee in the abdomen, mortally wounding him. He was rushed to the New Hanover Regional Medical Center in Wilmington, NC, where he underwent six hours of surgery. However, attempts to save him were unsuccessful, and Lee was pronounced dead at 1:03 pm on March 31, 1993, at the age of 28. The shooting was ruled an accident. After Lee's death, the producers were faced with the decision of whether or not to continue with the film. Lee had completed most of his scenes for the film and was scheduled to shoot for only three more days. The rest of the cast and crew, except for Ernie Hudson, whose brother-in-law had just died, stayed in Wilmington. Paramount, which was initially interested in distributing The Crow theatrically (originally a direct-to-video feature), opted out of involvement due to delays in filming and some controversy over the violent content being inappropriate given Lee's death. However, Miramax picked it up with the intention of releasing it in theatres and injected a further $8 million to complete the production, taking its budget to approximately $23 million. The cast and crew then took a break for script rewrites of the flashback scenes that had yet to be completed. The script was rewritten by Walon Green, René Balcer and Michael S. Chernuchin, adding narration and new scenes. Lee's stunt double Chad Stahelski was used as a stand-in and CGI was used to digitally superimpose Lee's face onto the head of the double. The beginning of the movie, which had not been finished, was rewritten, and the apartment scene remade using computer graphics from an earlier scene of Lee. The Crow was a sleeper hit at the box office. The film opened at number one in the United States in 1,573 theaters with $11,774,332 and averaging $7,485 per theater. The film ultimately grossed $50,693,129, above its $23 million budget. It ranked at #24 for all films released in the US in 1994 and 10 for R-rated films released that year. The Crow has an approval rating of 81% on Rotten Tomatoes based on 52 reviews and an average rating of 7/10. The critical consensus states: "Filled with style and dark, lurid energy, The Crow is an action-packed visual feast that also has a soul in the performance of the late Brandon Lee." The film also has a score of 71 out of 100 on Metacritic based on 14 critics, indicating "Generally favorable reviews". Reviewers praised the action and visual style. Rolling Stone called it a "dazzling fever dream of a movie"; Caryn James, writing for The New York Times, called it "a genre film of a high order, stylish and smooth"; and Roger Ebert called it "a stunning work of visual style". The Los Angeles Times praised the film also. Lee's death was alleged to have a melancholic effect on viewers; Desson Howe of The Washington Post wrote that Lee "haunts every frame" and James Berardinelli called the film "a case of 'art imitating death', and that specter will always hang over The Crow". Berardinelli called it an appropriate epitaph to Lee, Howe called it an appropriate sendoff, and Ebert stated that not only was this Lee's best film, but it was better than any of his father's (Bruce Lee). Critics generally thought that this would have been a breakthrough film for Lee, although James disagreed. The changes made to the film after Lee's death were noted by reviewers, most of whom saw them as an improvement. Howe said that it had been transformed into something compelling. James, although terming it a genre film, said that it had become more mainstream because of the changes. The film was widely compared to other films, particularly Tim Burton's Batman movies and Blade Runner. Critics described The Crow as a darker film than the others; Ebert called it a grungier and more forbidding story than those of Batman and Blade Runner, and Todd McCarthy of Variety wrote that the generic inner city of Detroit portrayed in The Crow "makes Gotham City look like the Emerald City". The distinctive features of the film for most critics were the fast-paced action and visual style. The cinematography by Dariusz Wolski and the production design by Alex McDowell were praised. While the plot and characterization were found to be lacking, these faults were considered to be overcome by the action and visual style. The cityscape designed by McDowell and the production team was described by McCarthy as rendered imaginatively. The film's comic book origins were noted, and Ebert called it the best version of a comic book universe he had seen. McCarthy agreed, calling it "one of the most effective live-actioners ever derived from a comic strip". Critics felt that the soundtrack complemented this visual style, calling it blistering, edgy and boisterous. Graeme Revell was praised for his "moody" score; Howe said that it "drapes the story in a postmodern pall." Negative reviews of the film were generally similar in theme to the positive ones but said that the interesting and "OK" special effects did not make up for the "superficial" plot, "badly-written" screenplay and "one-dimensional" characters. The Crow is mentioned in Empire's 2008 list of the 500 greatest movies of all time; it ranked at number 468. It has since become a cult film. The World Championship Wrestling star Sting got inspiration for his "crow" character from the movie. The original soundtrack album for The Crow features songs from the film, and was a chart-topping album. It included work by The Cure (their song, "Burn", became the film's main theme), The Jesus and Mary Chain, Rage Against the Machine and Helmet, among many others. In Joy Division and New Order bass guitarist Peter Hook's memoir Substance: Inside New Order, Hook relates that New Order were approached to provide the soundtrack for the film, with a cover of "Love Will Tear Us Apart", their hit as Joy Division as, like Eric, they too had "risen from the dead". However, the band's frontman Bernard Sumner vetoed the idea, citing they were too busy with their album Republic to commit to another project. Creator of The Crow, James O'Barr, was a big fan of Joy Division and had named the characters Sergeant Albrecht and Captain Hook after bandmates Sumner (who was also known as Bernard Albrecht early in his career) and Hook. Several groups contributed covers. Nine Inch Nails rendered Joy Division's "Dead Souls", Rollins Band covered Suicide's "Ghost Rider" and Pantera performed Poison Idea's "The Badge". The song "Big Empty" was not the Stone Temple Pilots' original choice for the soundtrack; they first recorded a version of "Only Dying", which they had recorded earlier as Mighty Joe Young in demo form, but it was replaced following Lee's death. The bands Medicine and My Life with the Thrill Kill Kult make cameo appearances in the film, on stage in the nightclub below Top Dollar's headquarters. The score consists of original, mostly orchestral music, with some electronic and guitar elements, written for the film by Graeme Revell. 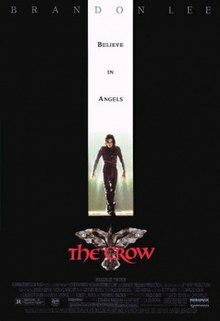 In 1996, a sequel was released, called The Crow: City of Angels. In this film, Vincent Pérez plays Ashe Corven, who, along with his son Danny, is killed by criminals. Ashe is resurrected as a new Crow. The character of Sarah (Mia Kirshner) reappears in this film and assists Ashe. The film also features Iggy Pop, who, according to the booklet insert for the film's soundtrack, was the producer's first choice for Funboy in the first Crow movie, but he was unable to commit due to his recording schedule. The film was followed by a television series and two direct-to-video sequels, each with a different person as The Crow. The Crow: Stairway to Heaven was a 1998 Canadian television series created by Bryce Zabel and starring Mark Dacascos in the lead role as Eric Draven, originally played by Brandon Lee. The second sequel, The Crow: Salvation, was released in 2000. Directed by Bharat Nalluri, it stars Eric Mabius, Kirsten Dunst, Fred Ward, Jodi Lyn O'Keefe and William Atherton. It is loosely based on Poppy Z. Brite's novel The Lazarus Heart. After its distributor cancelled the intended theatrical release due to The Crow: City of Angels' negative critical reception, The Crow: Salvation was released directly to video with mixed reviews. The third sequel, The Crow: Wicked Prayer, was released in 2005. Directed by Lance Mungia, it stars Edward Furlong, David Boreanaz, Tara Reid, Tito Ortiz, Dennis Hopper, Emmanuelle Chriqui and Danny Trejo. It was inspired by Norman Partridge's novel of the same title. It had a one-week theatrical première on June 3, 2005, at AMC Pacific Place Theatre in Seattle, Washington, before being released to video on July 19, 2005. Like the other sequels, it had a poor critical reception, and it was considered the worst of the four films. The Crow: 2037 was a planned sequel written and scheduled to be directed by Rob Zombie in the late 1990s; however, it was never made. On December 14, 2008, Stephen Norrington announced in Variety that he planned to write and direct a "reinvention" of The Crow. Norrington distinguished between the original and his remake: "Whereas Proyas' original was gloriously gothic and stylized, the new movie will be realistic, hard-edged and mysterious, almost documentary-style." Ryan Kavanaugh then announced on November 23, 2009, that his company, Relativity Media, was in negotiations with Edward R. Pressman for both the film's rights and financing. Norrington later stepped out of the project and, on April 7, 2011, it was announced that 28 Weeks Later director Juan Carlos Fresnadillo had been chosen to direct the film, which has since been regarded as a remake. Tucker Tooley of Relativity Media was chosen serve as executive producer, while Jose Ibanez, Jon Katz and Jesus de la Vega were to serve as co-producers. Meanwhile, Bradley Cooper was in talks to play the lead. It was reported on April 20, 2011, that the project was undergoing some legal battles. In late June 2011, Relativity Media announced their plans to continue in mid-lawsuit and had tapped Alex Tse, who co-wrote Watchmen. In mid-August 2011, it was announced that Cooper had dropped out due to scheduling difficulties and Mark Wahlberg, who was originally in talks for the lead in 2010, was again up for the part, with additional rumors of Channing Tatum or Ryan Gosling possibly taking the role, as well as James McAvoy. In October 2011, it was reported that Fresnadillo had departed the project as well. It was confirmed in January 2012 that Francisco Javier Gutiérrez had signed on to direct the remake, with Edward R. Pressman and Jeff Most on producing duties. In June 2012, producer Edward R. Pressman assured fans that "the original 1994 Crow film holds a special place in my heart. The current film is a 'reinvention' of James O'Barr's graphic novel for the 21st century. We're thrilled to have teamed with director Javier Gutiérrez and screenwriter Jesse Wigutow on this story, which remains true to the core of Eric Draven's plight for revenge. On the news of future remakes, however, O'Barr stated: "[...] I don't have great expectations. I think the reality is, no matter who you get to star in it, or if you get Ridley Scott to direct it and spend 200 million dollars, you're still not gonna top what Brandon Lee and Alex Proyas did in that first ten million dollar movie." On April 19, 2013, it was announced that Tom Hiddleston was in talks to play Eric. That same month, there were reports that Hiddleston would not be doing the film, but that Alexander Skarsgård was being eyed for the part. A week later, however, Skarsgård stated that he was not attached to the film. On May 4, 2013, Deadline reported that Luke Evans had been cast as Eric Draven. Evans reaffirmed to Superhero Hype that the film would be as faithful as possible to the original. On July 3, 2013, The Crow's creator James O'Barr was named as the creative consultant of the film. In an October 2015 interview, O'Barr would discuss what had changed his mind about the reboot, and efforts to make the reboot a more faithful adaptation of the comic book, while remaining respectful to the original film. On November 21, 2013, Schmoes Know had reports that Norman Reedus was up for the role of a character named "James", and that Kristen Stewart had at one time been considered for the part of Shelly. In December 2014, the studio hired Corin Hardy to direct the film. Evans told Den of Geek in an interview that he might not do the film, and it was later revealed that Evans has dropped out of the film due to other projects. On February 9, 2015, O'Barr told Blastr in an interview that he was interested in Sam Witwer for the role. As of October 24, 2014, the film was set to start production in the spring of 2015. On February 25, 2015, it was reported that Jack Huston would be starring in the film. On March 14, 2015, O'Barr confirmed to Dread Central at the Lexington Comic and Toy Convention that Huston had been cast as Draven in the reboot, and at a Q&A during the convention he further confirmed that Jessica Brown Findlay had been cast as Shelly Webster. On May 20, 2015, Deadline reports that Andrea Riseborough is in talks to co-star as the female version of Top Dollar. On June 15, 2015, according to Variety reported two stories: Forest Whitaker is in negotiations for a role and Huston has dropped out due to scheduling conflicts, but Relativity Studios are looking at Nicholas Hoult and Jack O'Connell for the role of Draven. On July 31, 2015, The Hollywood Reporter reported that production on the reboot stalled because of Relativity Media's bankruptcy. O'Barr told comicbook.com in an interview that the film will still happen. TheWrap reported that filming on the reboot was going to start in March 2016 with Corin Hardy on board as director. On June 15, 2016, Deadline reports that Hardy may return to the reboot. On August 10, 2016, Jason Momoa posted a photo of himself with Hardy on his Instagram account. On September 6, 2016, TheWrap reports that Momoa is cast and filming will begin in January 2017. On November 17, 2016, The Hollywood Reporter has reported that Davis Films, Highland Film Group, and Electric Shadow have acquired the rights to finance, produce, and distribute the film (now titled The Crow Reborn) from Relativity but may lose both Momoa and Hardy. In September 2017, it was announced that Sony will distribute the film. On May 31, 2018, it was announced that both director Hardy and star Momoa had exited the project. The Crow was first released on VHS on September 14, 1994. On October 18, 2011, The Crow was released on Blu-ray. The consensus among high-definition enthusiast sites is that the video and audio quality are excellent. ^ "The Crow". Box Office Mojo. Retrieved January 13, 2015. ^ "Brandon Lee, Michael Massee and the 'curse' of The Crow". telegraph.co.uk. Retrieved 26 January 2017. ^ Welkos, Robert W. (April 1, 1993). "Bruce Lee's Son, Brandon, Killed in Movie Accident". The Los Angeles Times. Retrieved November 6, 2015. ^ Pristin, Terry (August 11, 1993). "Brandon Lee's Mother Claims Negligence Caused His Death : Movies: Linda Lee Cadwell sues 14 entities regarding the actor's 'agonizing pain, suffering and untimely death' last March on the North Carolina set of 'The Crow'". The Los Angeles Times. Retrieved 2010-12-04. ^ Harris, Mark (April 16, 1993). "The brief life and unnecessary death of Brandon Lee". Entertainment Weekly. Retrieved November 6, 2015. ^ Ascher-Walsh, Rebecca (May 13, 1994). "The Crow cast deals with Brandon's Lee death". Entertainment Weekly. Retrieved November 6, 2015. ^ Fleming Jr., Mike (January 24, 2012). "UPDATE: F. Javier Gutierrez To Helm Jesse Wigutow-Scripted 'The Crow' Remake". Deadline. Retrieved November 6, 2015. ^ Friedman, David R. (1996). "The Mysterious Legacy of Brandon Leen". Todays Chiropr. 25: 34–38. ^ "The Crow". Rotten Tomatoes. 1 January 1994. Retrieved May 28, 2018. ^ "The Crow". Metacritic. Retrieved November 6, 2015. ^ Ritman, Alex (October 24, 2014). "'The Crow' Remake Aiming for Spring 2015 Production Start". The Hollywood Reporter. Retrieved October 21, 2015. ^ "Zombie Will Write/Direct Next "Crow" Flick". MTV. February 11, 1997. Retrieved November 24, 2012. ^ "What happened to the Rob Zombie script for Crow: 2037?". Experts123.com. Retrieved November 24, 2012. ^ "Scripts on the Net – The Crow: 2037 A New World of Gods and Monster, by Rob Zombie – Read The Screenplay". Roteirodecinema.com.br. September 22, 2008. Retrieved November 24, 2012. ^ "100 Wonderful and Terrible Movies That Never Existed". Io9.com. August 10, 2012. Retrieved November 24, 2012. ^ Fleming, Michael (December 14, 2008). "Norrington flies with 'Crow' franchise". Variety. ^ Woerner, Meredith (November 23, 2009). "The Crow Relaunch Moves Forward With Casting". i09. ^ Kit, Borys (April 7, 2011). "'The Crow' to Be Remade by '28 Weeks Later' Director". Hollywood Reporter. ^ "The Crow Flies Into A Legal Battle". indiewire.com. Archived from the original on 2011-07-29. Retrieved January 16, 2012. ^ "BD Horror News - Lawsuit or Not, 'The Crow' Will Fly". Bloody-disgusting. June 22, 2011. Retrieved January 16, 2012. ^ Kit, Borys (August 15, 2011). "Bradley Cooper Exits 'The Crow' as Other Actors Circle (Exclusive)". Hollywood Reporter. Retrieved January 16, 2012. ^ "Exclusive: We've Telepathically Learned Who May Star In 'The Crow'!". bloody-disgusting.com. February 25, 2013. Retrieved November 6, 2015. ^ "James McAvoy to star in The Crow remake". The Independent. February 26, 2013. Retrieved April 13, 2013. ^ "Crow Reboot Left Without A Director". Screenrant. October 14, 2011. Retrieved January 16, 2012. ^ "'The Crow' Reboot Snags New Director and Writer". Screenrant. January 24, 2012. Retrieved March 29, 2012. ^ "Edward R. Pressman Brings Archaia's "Feeding Ground" to the Big Screen". June 26, 2012. Retrieved June 16, 2015. ^ "O'Barr Resurrects "The Crow: Curare", Writes & Draws "Engines of Despair"". April 15, 2013. Retrieved April 15, 2013. ^ Sneider, Jeff (April 19, 2013). "'Avengers' Star Tom Hiddleston in Early Talks to Lead Relativity's 'The Crow'". The Wrap. Retrieved November 6, 2015. ^ Fleming Jr., Mike (April 29, 2013). "Alex Pettyfer In '50 Shades Of Grey'? Tom Hiddleston In 'The Crow'? Don't Dress For Either". Deadline.com. Retrieved November 6, 2015. ^ Fleming Jr., Mike (May 4, 2013). "'The Crow' Reboot Flies With Luke Evans". Deadline. Retrieved November 6, 2015. ^ Lesnick, Silas (May 7, 2013). "Luke Evans Updates on The Crow". SuperHeroHype. Retrieved November 6, 2015. ^ McNary, Dave (July 2, 2013). "James O'Barr Boards 'The Crow' Remake". Variety. Retrieved November 6, 2015. ^ Korsgaard, Sean CW (October 30, 2014). "Interview with James O'Barr, creator of The Crow". korsgaardscommentary.com. Retrieved November 15, 2014. ^ Reilly, Mark (November 22, 2013). "Is Norman Reedus In The Next Crow???". Schmoes Know. Retrieved November 6, 2015. ^ Ritman, Alex (October 24, 2014). "'The Crow' back to square". The Hollywood Reporter. Retrieved October 24, 2014. ^ Fleming, Jr., Mike (December 3, 2014). "'The Crow' Files With Director Corin Hardy". Deadline. ^ Bowles, Duncan (December 3, 2014). "Luke Evans may be dropping out of The Crow too". Den of Geek. ^ Sneider, Jeff (January 24, 2015). "Luke Evans Officially Exits 'The Crow' Reboot; Relativity Seeking New Star". The Wrap. ^ Sagers, Aaron (February 9, 2015). "Sam Witwer as The Crow? James O'Barr on casting, Luke Evans exit, budget issues". Blastr. ^ Ritman, Alex (October 24, 2014). "'The Crow' Remake Aiming for Spring 2015 Production Start". The Hollywood Reporter. Retrieved October 24, 2014. ^ Fleming Jr., Mike (February 26, 2015). "'The Crow' Remake Eyes 'Ben-Hur's' Jack Huston For Title Role". Deadline.com. Retrieved November 6, 2015. ^ Barton, Steve (March 13, 2015). "Exclusive: Jack Huston Confirmed as The Crow". Dread Central. ^ James O'Barr Q&A - Lexington Comic and Toy Convention. YouTube. 14 March 2015. Retrieved November 6, 2015. ^ Jaafar, Ali (May 20, 2015). "Andrea Riseborough In Talks To Join 'The Crow' Remake As Villain". Deadline. ^ Kroll, Justin (June 15, 2015). "'Star Wars: Rogue One': Forest Whitaker Joins Standalone Film (EXCLUSIVE)". Variety. ^ Lang, Brent (June 15, 2015). "Jack Huston Exits 'The Crow' Remake". Variety. ^ Ritman, Alex (July 31, 2015). "Relativity Fallout: 'The Crow' Remake Sees Pre-Production Stall". The Hollywood Reporter. ^ Burlingame, Russ (August 17, 2015). "The Crow Reboot "Definitely Will Happen," Says Creator James O'Barr". Comicbook.com. ^ Sneider, Jeff (November 3, 2015). "'The Crow' to Fly Again in March as Relativity Signs Director Corin Hardy to Holding Deal". The Wrap. ^ Sneider, Jeff (March 16, 2016). "'The Crow' Loses Director Corin Hardy as Dana Brunetti Takes Creative Reins of Relativity". The Wrap. ^ Fleming, Jr, Mike (June 15, 2016). "Director Corin Hardy Lands Paramount's "Dirty Dozen Goes To Hell" Actioner 'Hell Bent'". Deadline. ^ "Instagram photo by Jason Momoa • Aug 6, 2016 at 7:23pm UTC". instagram.com. Retrieved 26 January 2017. ^ Sneider, Jeff (August 10, 2016). "'Game of Thrones' alum Jason Momoa in talks to star in 'The Crow'". Mashable. ^ Gonzalez, Umberto (September 6, 2016). "Relativity's 'The Crow' Reboot to Begin Production in January (Exclusive)". The Wrap. ^ Seigh, Steve (September 1, 2017). "Sony to distribute the long-gestating reboot of The Crow". JoBlo. ^ "'The Crow' Remake is Dead Again as Jason Momoa and Corin Hardy Exit". /Film. 2018-05-31. Retrieved 2018-05-31. ^ Nichols, Peter M. (September 9, 1994). "Home Video". The New York Times. Retrieved April 16, 2016. ^ "The Crow - High-Def Digest". Bluray.highdefdigest.com. Retrieved January 16, 2012.